Culture as a % of overall employment. Culture industry includes arts, culture and recreation. Culture & recreation industry employment included using the 2-digit NAICS code 71, which includes arts, entertainment and recreation. Culture and recreation industry employment included using the 2-digit NAICS code 71, which includes arts, entertainment and recreation. Arts and culture is a vital part of the region. It helps create a sense of place, brings people together, provides entertainment, increases quality of life, and is an important contributor to the local economy. Tracking the number of employees in this sector is a proxy for the overall vitality of the arts and culture scene. 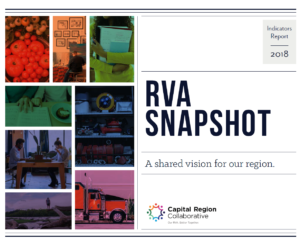 In the Richmond Region, this statistic increased from 2.1% to 2.2% since 1st quarter 2015.